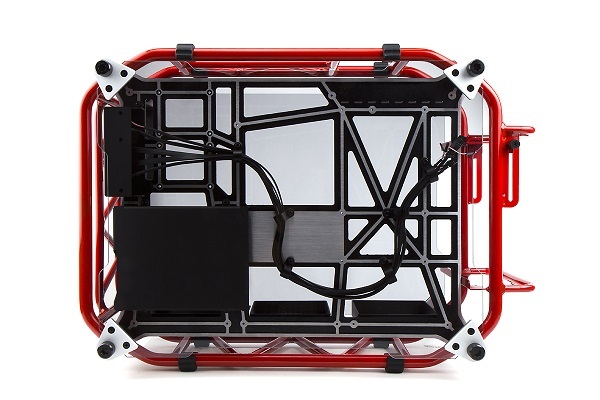 Chassis manufacturer In Win is starting a habit of producing zany-looking enclosures for trade shows. Last year we saw the H-Frame at Computex, though the retail version lost some of the cool looks. At CES 2013, In Win debuts the D-Frame. Inspired by the look of motorcycles, the company tells us, this chassis uses 11 aluminium pipes to create a tubular case with a distinctive look and feel. Supporting a trio of 3.5in drives, two 2.5in drives, motherboards with either a mATX or ATX form factor, eight PCI slots, graphics cards up to 330mm long, and PSUs of practically all sizes (thanks to an adjustable holder), the D-Frame uses tempered glass on both sides. The structure is suitably rigid and well-finished, from what we saw, and In Win says that it will be available in either orange or red. It is due out in Q2 this year, with the wait attributable to the fact that the firm can only produce 50 of these chassis a week. Tentatively priced at $399, you had better start saving if it has piqued your interest. I absolutely love how it looks; that's some lovely engineering! However, it's not very practical now is it. Being effectively open to the air like that. Can't say I am a fan of that to be honest.